Standard Deviants has been offering top notch educational videos for over 20 years in core subjects. They have taken their newest online educational videos and coupled them with lots of activities to create Standard Deviants Accelerate, the perfect curriculum supplement for your homeschool! I used a couple of the Homeschool Courses offered in Standard Deviants Accelerate in our homeschool with my son. Since he is delayed in math, I chose to focus on the Arithmetic and Fundamental Mathematics modules. There are 2-3 lessons for your student to complete under each concepts. Instructions are clearly noted at the top of the screen for each lesson. You'll notice in the picture above that there are tabs listed at the top of the page. The Video tab contains the teaching video and written transcript of the lesson. The entire lesson can be watched on the video which is great for a mom who doesn't feel strong teaching math to her kids. The Vocab tab contains the vocabulary words from the lesson. The math vocabulary word definition is listed as well as a sound icon where the student can hear the word and definition. Next is the Diagram tab where a math puzzle, etc. is given for your student to work. The Quiz tab has the lesson's quiz for your student to complete. I love that these quizes are automatically graded for me! If your student misses a question, the correct answer is given in a video. There is a "see video" button that your student will press in order to see the correct answer and how to arrive at the correct answer. The final tab is the Written Answer tab. Here a question is given relating to the theme of the lesson. Also listed under that main question is a couple of other writing prompt questions that you can have your student answer in written form. You can get a notebook for your student to keep these questions and answers in. The lessons are presented in both written and video format. You are given the option to print out the full transcript of the lesson too. The young adults that are used in the video lessons do a great job at presenting the lesson in a fun and engaging way. I love that we can go at our own pace too. 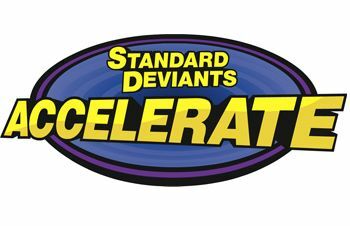 If you're looking for an online learning option for your homeschool to help out with teaching subjects that you don't feel comfortable teaching, then you need to check out Standard Deviants Accelerate. You can read more reviews from the Schoolhouse Review Crew simply by clicking on the image below.